Microsoft’s event today saw plenty of new hotness announced, including an 84-inch Surface Hub and the amazing HoloLens, but one of the biggest announcements as far as gamers are concerned is the news that Xbox One titles will be streamable to Windows 10 PCs and tablets later this year. Speaking at the gaming portion of the event, head of Xbox Phil Spencer announced that games will be streamable across both PCs and tablets running Microsoft’s upcoming version of Windows which should have gamers eager to upgrade to the new software when it becomes available later this year. The news was accompanied by a demonstrations which saw Forza Horizon 2 streamed from an Xbox One to a Microsoft Surface, something that has us eager to find out more though as anyone who plays games on an iPad will know, you might want to plug a mouse and a keyboard into that bad boy if you’re going to do any Halo-ing. According to the announcement, making this all work will just be a case of following a one-time setup that will marry your Xbox One with your PC, with playing games after that being a simple case of selecting them from a menu in the Windows 10 Xbox app. Voice and text chat will also be supported by the Xbox app, and users will be able to keep on top of their friends’ achievements no matter what device they happen to be using. 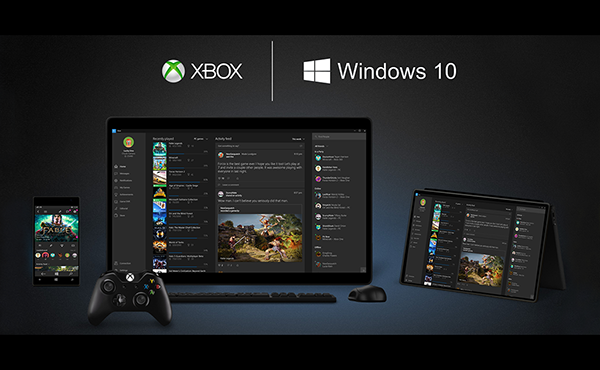 Interestingly though, Spencer noted that some Xbox One multiplayer games will connect with Windows 10 devices in a move that he says will help leverage the power of Xbox LIVE. Whether that translates into gamers with PCs competing directly with those on an Xbox One remains to be seen, but expect the age-old mouse and keyboard Vs. Xbox game controller argument to rear its ugly head in due course. Because, you know. We don’t have enough of those arguments already.